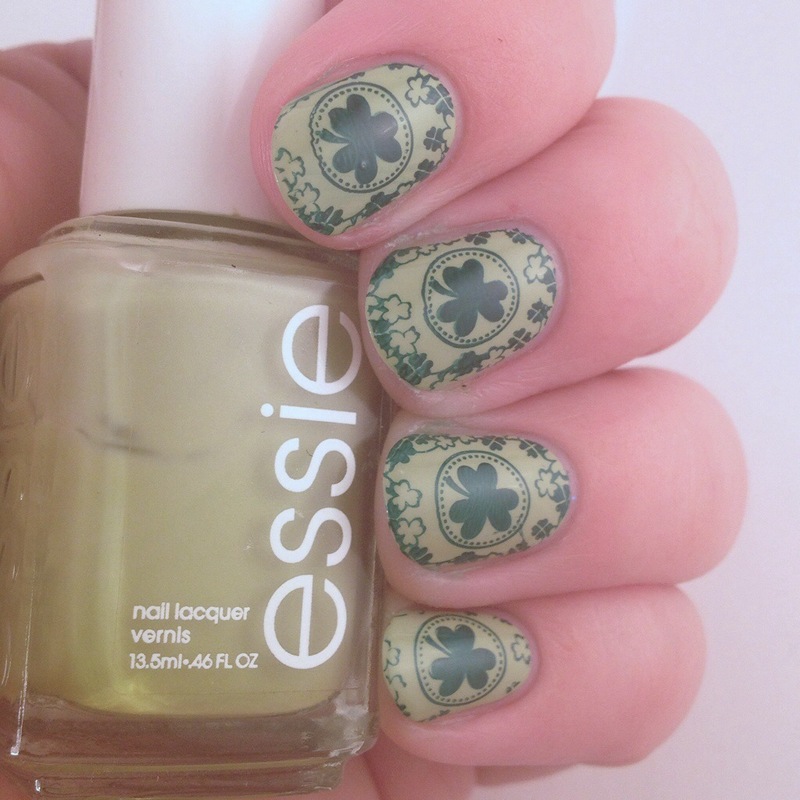 Stamping Saturday- St. Patrick’s Day Nails | Polish Me, Please! As I write this I am on my way downtown to celebrate SPD so I’ll make this quick! I decided to use my Bundle Monster holiday plates to do a festive mani for St. Patrick’s Day. Let’s have a look! I used Essie Navigate Her for the base, and NOPI Khloe Had A Little Lam Lam with H05 for the design. I really dislike this on my oval nails. I could have done much better on the execution, and the shape just doesn’t do it for me w the art so that’s too bad. I hope you all like it ok and more importantly are having a good weekend! Make sure to check out everyone else’s Stamping Saturday manis by clicking the button below! Do you think nail art looks weird or is hard to pull off on oval nails? Do you have any St. Patrick’s Day plans? Don’t forget to wear green!! *pinch pinch* Thank you all for reading and commenting and till next time- Happy Polishing!! Great minds think alike! 🙂 Thank you!! I don’t think anything is weird here! in fact i want to say WOW i love it! so funky and different! Alright then! Thanks! 😉 Yours looked AWESOME! I think I much prefer your nails round! Maybe it’s just that we’re all going through a “change the shape” obsession….Talk to you later, right bike. Oh and- I’m absolutely going to try to copy your stamping style and stick to basic colors on top of pretty bases. All of your stamping manis are sooo pretty. I don’t think it looks weird on your nail shape at all! I did a lil’ something for St. Patrick’s Day. Yesterday I got a few people together and had lunch/beers at this place called the Alehouse. It wasn’t as crowded as I thought it would be, but the service sucked…womp, womp! Then we went to one of my friend’s in-laws for a traditional Irish dinner. I was ready to BURST after all that food & beer. No right bike, though…basically once I started feeling a little buzzed, I stopped because I had to drive home & work today. Ah, drinking as an adult, lol. That sounds nice, too. Yeah drinking as an adult and now as a parent for me- not quite the same. We are having St. Patrick’s Day dinner on Thursday at my mom and dad’s house because they’ve never had corned beef before! I don’t even remember what I had for dinner that night… fast food of some sort. What kind of base coat do you use? I use Sally Hansen Hard As Nails. I’ve used others occasionally but I like how the SH base really does make my nails stronger. Thanks! I really hated this design on these nails. However right at this moment I have some free-handed cherry blossom art on my nails and it looks sooooo pretty on my ovals!